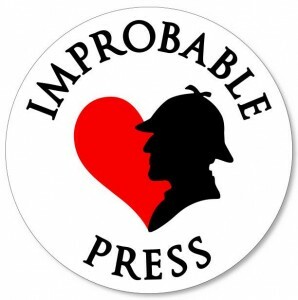 Baker Street Irregulars: The Game is Afoot is the second volume of an anthology series that places Sherlock Holmes (and often John Watson) in various alternative realities. The first volume included versions where Holmes was a nun, a dog-like alien and even a parrot! My story in this new volume, ‘The Problem of the Three Journals’, recasts Holmes and Watson as contemporary Australian hipsters! John’s a barista in the cafe they co-own and they still solve crimes together. The book is due out on 24 April, which is not far away now – and the publisher has just announced that actors have been engaged to read the audiobook! I’m absolutely thrilled to find that New-York-based Australian actor, Jamie Jackson, will be reading ‘The Problem of the Three Journals’, and thereby getting the accent right! The other performers on the upcoming audiobook are Korey Jackson, Karen Chilton and Jonathan Todd Ross. 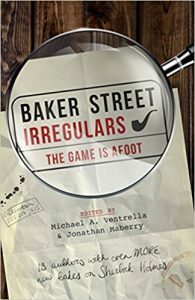 I don’t know yet when the audiobook will be out, but in the meantime you can pre-order Baker Street Irregulars: The Game is Afoot from Amazon, ready for delivery on 24 April!